What is SIRT and what are SIR-Spheres® Y-90 resin microspheres? SIRT is a targeted treatment for liver tumors that delivers millions of tiny radioactive beads called SIR-Spheres Y-90 resin microspheres directly to the liver tumors. The development of SIR-Spheres Y-90 resin microspheres started in Australia in the 1980s, with regulatory approval being granted in the United States in 2002. Thousands of patients have now been treated both in research studies and routine clinical practice at centers of excellence around the world. SIR-Spheres Y-90 resin microspheres are approved in the United States for the treatment of inoperable colorectal liver metastases in combination with hepatic arterial chemotherapy using FUDR (floxuridine). These liver tumors are also known as secondary liver metastases because the cancer cells have spread to the liver from the primary colon or rectal tumor. How do SIR-Spheres® Y-90 resin microspheres work? The SIRT procedure enables radiation – which is often used to treat cancer – to be sent directly into the liver tumors by using the tumor’s blood supply. The normal liver tissue takes about 90% of its blood supply from the portal vein that flows from the intestine while liver tumors receive about 90% of their blood supply from the hepatic artery. SIR-Spheres Y-90 resin microspheres are targeted directly at the liver tumors via the hepatic artery, so exposure to the remaining healthy liver tissue is minimized. The majority of microspheres are approximately 32 microns in diameter, about a third of the width of a human hair. 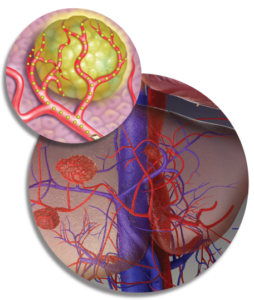 The microspheres are small enough to flow through the hepatic arteries, but they are too large to pass through the small blood vessels within the tumor, where they become permanently lodged in the tumor bed. SIR-Spheres Y-90 resin microspheres contain the radioactive element yttrium-90, which delivers beta radiation over a relatively short distance in human tissue. Yttrium-90 has a half-life of approximately 2.5 days; therefore most of the radiation (over 97%) is delivered to the tumor in the first two weeks following treatment. Since SIR-Spheres Y-90 resin microspheres are delivered directly to the tumors, this allows a larger dose of radiation to be implanted locally than is possible with conventional external beam radiotherapy.